If you are planning or thinking about going to Brunei this coming weekend or holiday season there is direct ferry services from Menumbok Jetty Terminal to Brunei. With this new ferry services one don't have to go to Labuan first before proceeding to Brunei. It is predicted that, this new ferry services will increase tourists flow and goods between Sabah and Brunie. The ferry is owned by Brunei-based company, Syarikat PKL Jaya Sendirian Berhad. It is 44.49 meters long, equipped with safety and security devices including closed circuit television units (CCTVs) and costing around RM 19.2 millions and the capacity to accommodate around 200 passengers and 45 vehicles per trip. However, there is some restriction on the size of the vehicle. Surely containers lorries most probably will not be allowed on board. The ferry services is available daily. 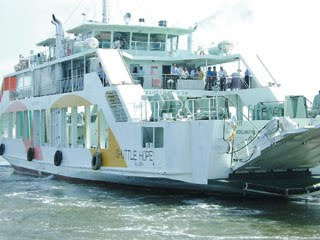 It departs from Menumbok Jetty Terminal and it takes about 2 hours and 30 minutes to reach Serasa Ferry Terminal in Brunei at the speed of 14 knots. My 2-cents: If you are thinking about going to Brunei with car, I think it is much better to drive all the way to Brunei through Lawas. You can see more things along the way to Brunei. A brief stop in Lawas is not a bad option.